Human rights and climate change are priority issues for many small islands. The IPCC special report on the impacts of global warming of 1.5 C above pre-industrial levels with a focus on the strengthening the global response to the threat of climate change, sustainable development and efforts to eradicate poverty was a wake up call for the world predicting sea-level rises between 0.26 and 0.77m by the end of the century even if global warming is kept to 1.5 C. For many low lying islands, that is already too much, but global warming is currently on track to reach double that level if we continue as we are. Susie Alegre’s talk at the SOAS Law, Environment and Development Centre on 29th November 2018 described what climate change means in human rights terms for small island populations now and in the near future with threats including fatalities from catastrophic events such as hurricanes or thinning ice in the Arctic leading to fatal falling through ice incidents that affect vulnerable indigenous communities particularly acutely; food insecurity and damage to infrastructure affecting access to health and education due to tidal surges, degradation of reefs and rising sea-levels; and risks relating to security, governance and communal land rights in the aftermath of natural disasters. 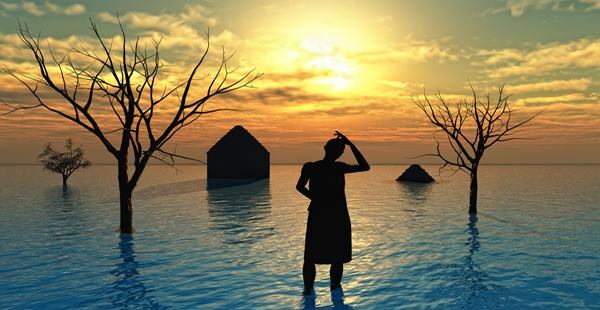 Of particular concern for small island communities is the risk that islands or entire island nations may become uninhabitable or completely submerged. This is an issue that needs to be addressed through creating pathways for displaced people including the possibility of developing international refugee law to include those people colloquially referred to as “climate refugees”. In terms of sovereignty and the self-determination of peoples, there is an urgent need for the international community to map out the way small island states, their natural resources and their people will be treated in the international order in the event that their territories disappear. Small island states are at the forefront of creative legal steps to challenge the causes of climate change and hold those responsible to account. In her talk, Susie describes various approaches that have been taken including suing polluting countries for trans-boundary harm, mounting human rights challenges against governments and international organisations like the EU and developing constitutional rights to a healthy environment. The response to climate change needs to be creative and multi-faceted. Legal challenges need to reach out across legal and other disciplines to push for change. While small islands may be “the canary in the coalmine” of climate change, we all need to wake up to the threats they are warning us of. The law is a part of the solution, but ultimately, what is needed is a global change of culture. As the international community gathers in Katowice for COP24, the real life impacts on people around the world and the need for ambitious targets that would save the lives of millions of people in the coming decades need to be at the forefront of their minds. Publication in the EHRLR: Brexit, Human Rights and Self-Determination – A Perfect Storm in the British Crown Dependencies and UK Overseas Territories?